A short stroll from St Denys train station in Southampton, or a much longer uphill one from Southampton Central, Its a lovely little micro-pub with almost proper opening times for a change, 12.00 – 11.00 every day. It’s simply furnished with various seating options, some clutter on the walls and there are books, you can read on site for free. or take home for a small donation. Simple furniture and book reading. 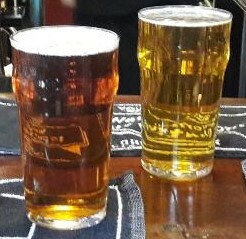 Of course there is beer as well, there are four handpumps and the same number in keg taps, I went for a Red Cat Mosaic. Its a place with a varied customer base , the younger , hipper ones typically turned up just after this picture. There is no food but you are welcome to bring your own or have it delivered. the pub will provide you with the necessary cutlery, more than that they will direct you to the nearest outlets. A bit different from the norm, but one of Southampton’s finest drinking establishments. One of my favourites, too, Citra. Southampton really has embraced the small pub quicker than Pompey, hasn’t it. Really good beer, too. Yes I seem to discover somewhere new every time I’m down there.